These are the main stories featured in Sunday's newspapers. The Sunday Times of Malta says there has been a wall of silence within the government after the latest revelations on the ownership of the secret company 17 Black. It also reports that Steward Healthcare has been granted extensions for completion of its projects. The Malta Independent says Joseph Muscat is under pressure as senior ministers demand action against Konrad Mizzi and Keith Schembri in the wake of the 17 Black revelations. The newspaper also reveals that a former director of a lead power station partner has been jailed 16 years for laundering $45m in a Nigeria project. MaltaToday says that five French secret agents killed in a plane crash two years ago formed part of a cell operating from a Balzan house which monitored French weapons delivered to Libya. 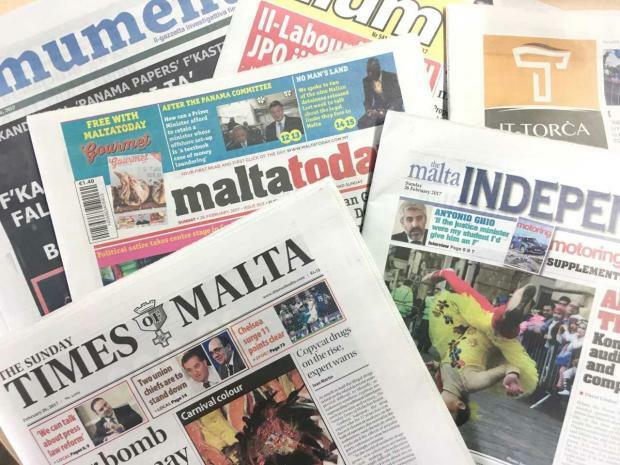 The newspaper also says that in view of latest revelations, the positions of minister Konrad Mizzi and chief of staff Keith Schembri have become untenable. It-Torċa reports that foreign companies are facing problems to open accounts in Maltese banks, because of foreign regulatory pressures. Il-Mument says Joseph Muscat is playing for time following the latest disclosures on 17 Black. KullĦadd gives prominence to the opening of Muża, the new museum of fine arts. Illum says Pilatus Bank, which has lost its licence, has a month's time to appeal the decision.